I was browsing and reading news articles on some of the major English news websites, and one news story caught my attention, which was about Halloween in Tokyo. What actually caught my attention is its title: Halloween snowballs into popular phenomenon in Japan. And the word “snowball” in this sentence is used as a verb to mean “to grow or increase rapidly in size, intensity or importance. Indeed, in recent years, we have been seeing Halloween grow rapidly in popularity, and the article uses the word “snowball” to describe the trend. We have a similar expression in Japanese, although we use the word “snowman” instead of “snowball”. And as far as I know, when the word “snowman” is used in this context, it’s more often used for something bad or negative to grow quickly, like debts, if not always. 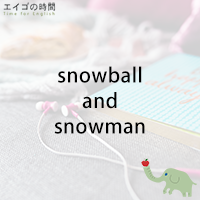 In English, “to snowball” can be used in both ways. 1. things that grow slowly but steadily. 2. things that decline rapidly. 3. things that grow quickly. Next Post ホテルはどこだ？ – Where did Junko stay?